Loneliness is not about melancholy, but extraordinary commitment, something worth our notice and attention. A feeling common to every soul, loneliness is communicable. 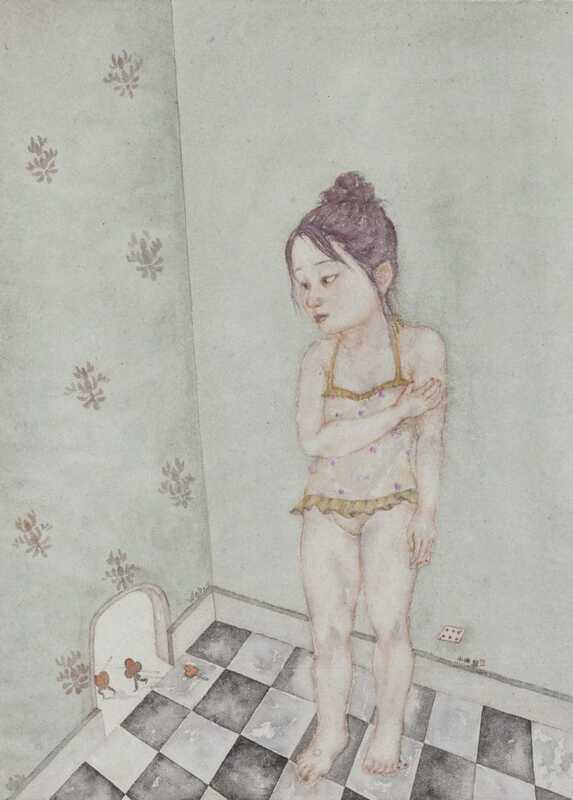 Before my interview with Qu Weiwei, her works would suddenly find echoes in my heart during my contemplation of them. I was overwhelmed by a sense of childhood helplessness, a feeling of isolation from the crowd, and a sharp pang of pain, a true pain that came from her being true to herself. 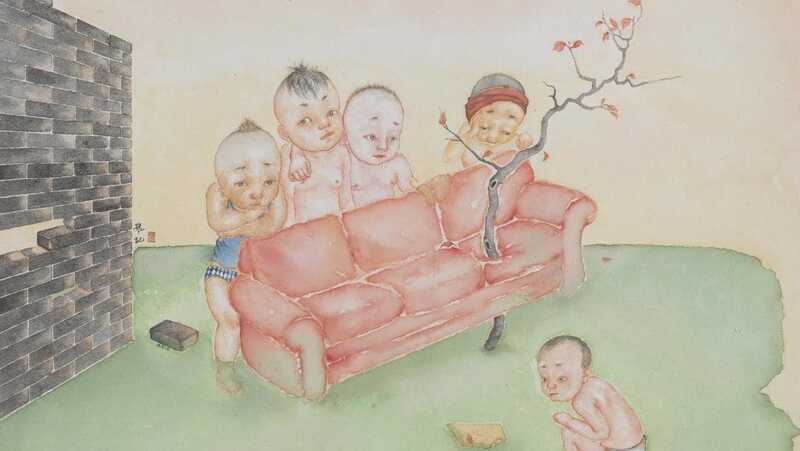 In Qu’s studio located in Beijing’s Shunyi District and half bathed in warm winter sunlight, the fragrance of tea and the puffs of steam over the stove gave me a taste of her obstinacy, loftiness and freedom from the fear of loneliness. With a sky clearer than past years, this winter proves beautiful. With great skills in traditional Chinese ink-wash painting, you are good at using colors. But your paintings exude a sense of modernity, evocative of a well-educated young French lady of classic beauty, frosty-faced, loitering beside the Seine River in her most fashionable clothes, with a cigarette between her lips… In the first place, did this style reach out to you or the other way around? I was educated in ink-wash painting at the Central Academy of Fine Arts. I majored in traditional Chinese painting. Soon after obtaining the master degree, I was exposed to a great number of contemporary Western works, which gave me huge visual and conceptual impacts. The conflict between the West and the East led to a year-or-two break in my ink-wash painting. During that period, I’ve been thinking about how to inject a sense of modernity into this traditional art, and working to crystallize whatever came to my mind with my watercolors. I think I finally saw the light at the end of the tunnel: What you paint, or rather its truthfulness, is far more important than what you paint with; only when you are able to control your mind, can you control the way things turn out on your paper. Of course, I feel lucky to have received training in traditional Chinese painting. So I credit my style to a combination of many unique things in my life. They reached out to me and made me who I am. Please tell us more about yourself. There is a touch of loneliness in your work. Does this has anything to do with your experience? Yes. I think it is delicate emotions that distinguish human beings from animals. An unhappy marriage left me severe trauma. The end of an unforgettable relationship that lasted over a decade keeps provoking me to stand back to ponder over my raison d’être. In painting, I am a shadow of what I create, and what I create is the way out for myself. Now I have an adorable 4-year-old daughter. But I’m unable to be always by her side due to the cruel reality. And this separation overshadows my life. So in this painting you can find a lovely but strong-minded girl, which is a way to express my love and nostalgia for her. And as these complex emotions are shared by all, my paintings can always bring back the memories about some of your own experiences. You see, when God closes a door, he opens a window. This holds true especially to artists. Profound insights in life came as a great gift, but unfortunately not a free one. You get to pay a price. Indeed, now I live an unstable life. If I could choose between a cozy life and painting, I would still paint, probably because I can get a stronger sense of self-fulfillment from painting. Weiwei, as a full-time painter whose works have been auctioned at a higher and higher price over the years, have you ever asked why they wanted to have your works in their collections? Actually, I’ve been painting for over a decade, and my style varies in different stages. For example, one of my paintings shows a boy dressed as Superman standing in the corner; the buyer said that was exactly what he looked like when he was a boy. 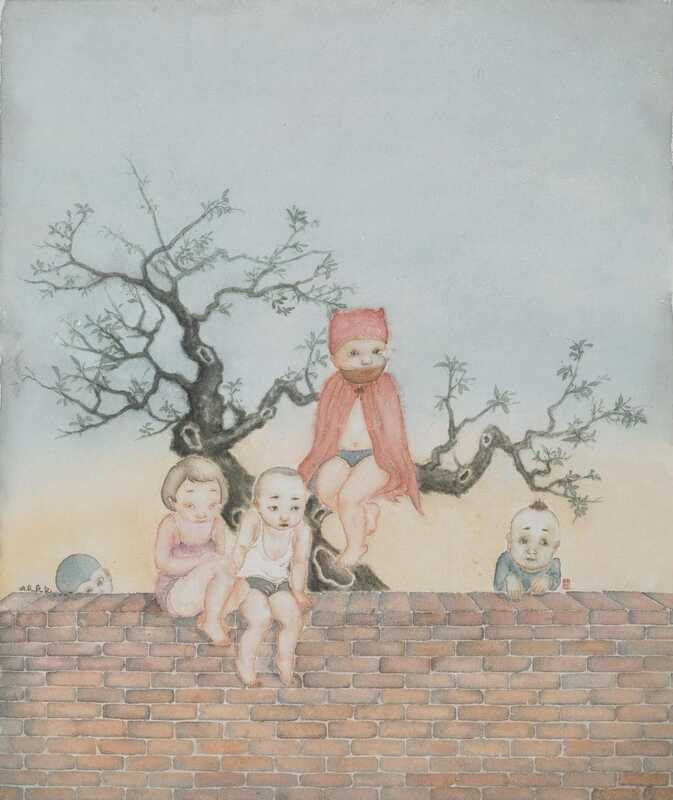 This painting recalled his childhood memories. Oh, I saw that painting from your album. Why is there a pool of something out there? Wetting his pants from excitement? Ha-ha, of course not. It is about curiosity! It is a rain puddle, one of those childhood puddles that my parents forbade me to wade in case I might wet my shoes. But as a little girl, I was so curious about nature that I would just ignore the warning by splashing through. When I was a little girl, I had so many things to do for fun during the day: climbing trees and walls, running wild in the fields, or blocking chimneys as a prank. Children at that time enjoyed great freedom. Is it true that quite a few of your works are an expression of your nostalgia? Yes. Nostalgia for childhood and good old days is an eternal topic. Some blockbusters lately also dealt with the theme. 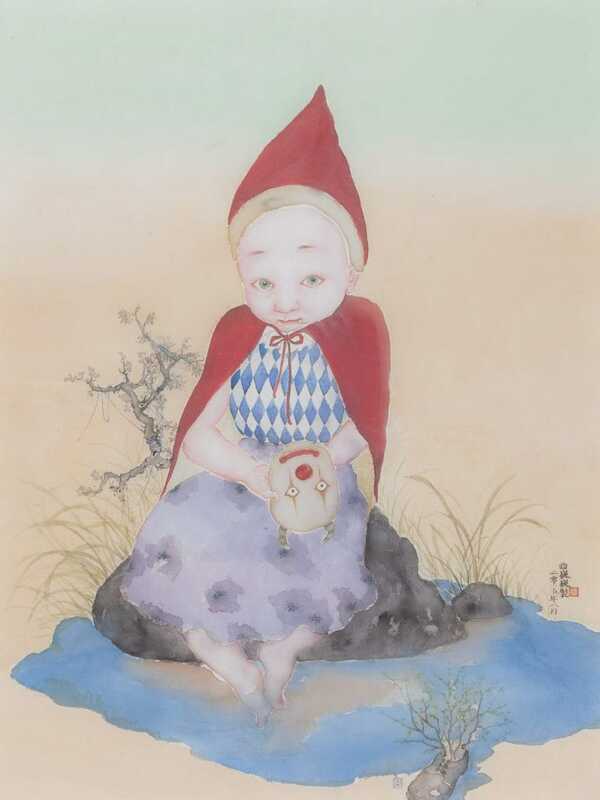 When I was a little girl, I would spend lots of time climbing trees, fishing, and making toys, paper cards and clay figures. This is a memory shared by all, for back then we played all together. It didn’t take an appointment, because you would find your peers all around in the neighborhood. However, such collective memory has become a luxury for children nowadays; and even worse, the more toys they have, the lonelier they seem to be. On nostalgia and the fear of future, people have talked their way into the new century. My works strike a chord with those like-minded collectors with similar experiences, many of whom are working at Chinese embassies abroad. In your paintings, the walls have many small holes and cavities. Are there any special meanings? The perfection in imperfection. I once retreated into my shell when on the rebound. But when depicting these cavities and holes, I felt a sense of relief. I learned to accept my true feelings that I used to be afraid of facing, and came to live and play with those imperfections. This change of mindset made imperfections so powerful that I grew fond of tragedy, which gave me as much pain as profound aesthetic insights. Although all the figures you paint are children, the content varies greatly. Do they tell different stories or express different moods? This is perhaps a psychological problem. “The child is father of the man.” I think children as the subject suit me better. Each of my painting stages is dominated by a theme decided by my feelings at that time. Feelings shape moods, and then images on the paper. 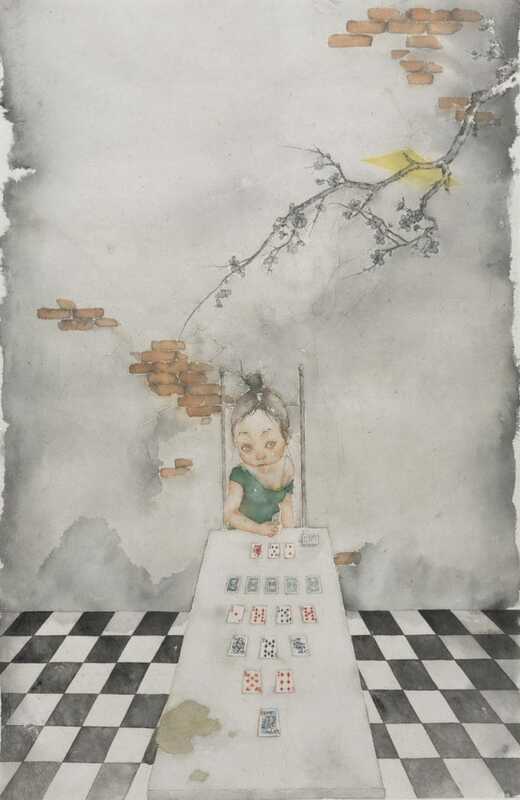 For instance, once I was a fan of Tarot cards, so a series of my paintings were themed on card playing, giving you a sense of uncertainty and expectations about the future. After divorce, I moved to this studio, feeling sad and shutting myself away from the outside world. That’s how The Fugitive Poker Soldier came into being. In the painting, the girl stands helplessly in an enclosed space. The poker soldier has fled through the hole in the wall, with her “heart” left behind from her split body. However, now when I look at the painting, I see the hole as a way out instead of a scar. There must be a way out for everything. Wounds heal, only with time. Your paintings give some people a sense of melancholy. Do you think it is a good thing? For an artist, it is always good to send tingles down your spine, because it offers a taste of the real life and inexhaustible source of inspirations. It is a godsend. For me, art is about recording life, nostalgia for childhood, emotional injuries in adult life, as well as uncertainties and expectations about the future. I present life as it is. We savor what life has to offer through various experiences. Too many of us only show others the best of ourselves instead of facing failure, loneliness and anger boldly. Actually, the perfection of life lies in the complete gamut of experiences, and it would be a pity to miss some of them. I have never thought about it, nor been bothered by it. I remain true to myself and present a true picture of life with my brush. It is not hard for me, because I can’t do otherwise. We viewed Qu’s paintings once again. 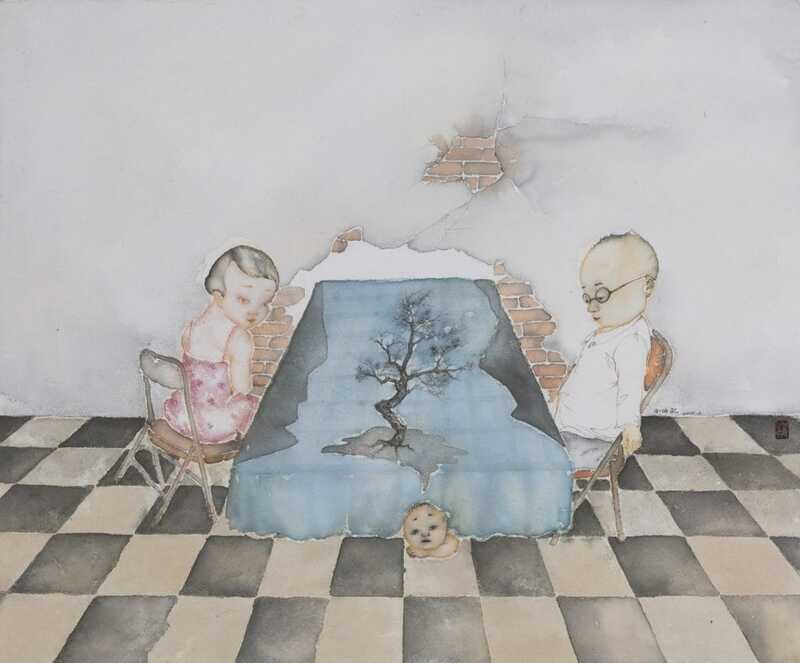 With delicate artistry, she applies colors repeatedly and sometimes even to the back of the paper, which gives her works a rich and clear texture. There is a stark contrast between her romantic gentle hues and the mood of the figures portrayed. I think this, however, is about tolerance, tolerance to what is going on against a broader background, and finally a sense of joy that follows what you have been through. The composition is also fascinating, even evocative of Pop Art: big children, small toys, holes in the wall, and tufts of grass… You can feel the tension and interaction between them, and a sense of puniness behind mightiness. After the interview on that Sunday, I walked down the street, with an unprecedented sense of sobriety and connection. It was the power of art, collective communication in silence, and solace of greater sublime. My thanks go to Qu Weiwei.